Our CC 600 Conveyor chains are produced in malleable iron with metal pins, with pins that are unhardened. This proven design CC600 Chain results within an assembled chain that’s highly durable and wear resistant. Designed withing the gas bottling sector (Particularly Liquid Petroleum Gas ) our CC600 series remains a product of 1st choice for distributors and end users alike, where a quality product is necessary first time, every time. Our CC600 Chains and Sprockets – Ex-Stock from our factory in Hangzhou, CN. The CC600 chains are designed for use in multistrand conveyors handling individual loads under conditions of mild corrosion. They are usually supported in channels and are highly flexible, allowing for fluid motion and flexibility when necessary. This versatility enables them to be used in a variety of durable applications but their main application is usually in the bottling market where they are known as on to handle crates and gas bottles. Stud ends flush with hyperlink. Huge rubbing areas top and bottom. Bores are machined to H9 Tolerance, BS 4500 Part 1 (ISO R286). Keyways are metric, either tapered or parallel to ;BS 4235 Part 1, 1972 (based on ISO/R773 & R774). 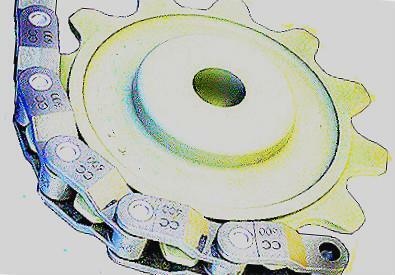 Sprockets are keywayed in pairs on middle line of the tooth gap with bosses facing, deep end of tapered keyway on boss aspect. Single setscrews are positioned over the main element method. Any second setscrew is put at 90 degrees to the initial. For further advice, or to find out how our range of chain and sprockets can boost the application, follow the link below and contact we.